Implantes en la región pterigomaxilar: alternativa al aumento del seno maxilar. en zonas con una extrema reabsorción del maxilar. complejas e invasivas como el aumento de seno maxilar, para la rehabilitación de este sector. Se describen indicaciones, ventajas e inconvenientes, bases anatómicas, estudio clínico – radiográfico, técnica quirúrgica, protésica y seguimiento clínico radiográfico a 3 años. Balshi. T (1995) The use of ptertigomaxillary implants in the partially edentulous patient : A preliminary report. Balshi. T (1999) Analysis of 356 pterigomaxillary implants in edentulous arches for fixed prosthesis anchorage. Int. Balshi. T (2005) Analysis of 164 titanium oxide-surface implants in completely edentulous arches for fixed prosthesis anchorage usin the pterigomaxillary region. Int. J of Oral & Maxilofacial Implants V20:946-952. Celletti y cols (1995) Histologic evaluation of osseointegrated implants restore in nonaxial functional occlusion with preangled abutments. The Int. Journal of Prosthetic & Restorative Dentistry V15, N6:562-573. Graves Stuart (1994) The pterygoid plate implant: A solution for restoring the posterior maxilla. Int. J of Periodontics and Restorative Dentistry V14;6,513-523. Lazara - Venturelli (1995) Cap. VIII - Implantes en la tuberosidad maxilar. Oseointegracion en la práctica clínica. 2da rev. ed. Biomax. Nystrom. E & cols (1993) Bone grafts and Branemark implants in the treatment of the severly reabsorbed maxilla. A 2-year longitudinal study. Int. J of Oral & Maxilofacial Implants;8:45-53. Tulasne, J.F. (1992) Osseointegrated fixtures in Pterygoid Region. Quintessense Publishing Co. 182-8.
procedure and preliminary results. Int. J Oral & Maxilofacial Implants V12; 6, 814 – 819. Van Steenberghe. D, Lekholm.U (1990) The applicability of osseointegrated oral implants in the rehabilitation of partial edentulism: A prospective multicenter study on 558 fixtures. Int. J of Oral & Maxilofacial Implants V5,3,272-281. Venturelli.A. (1996) A modified surgical protocol for placing implants in the maxillary tuberosity. Int. J of Oral & Maxilofacial Implants;11:743-749.
considerations. Dent. Clin North Am 34;457-472. HASKEL, Yoel. Implantes en la región pterigomaxilar: alternativa al aumento del seno maxilar.. Actas Odontológicas (Publicación discontinuada), [S.l. ], v. 5, n. 1, p. 5-13, apr. 2016. ISSN 2393-6304. 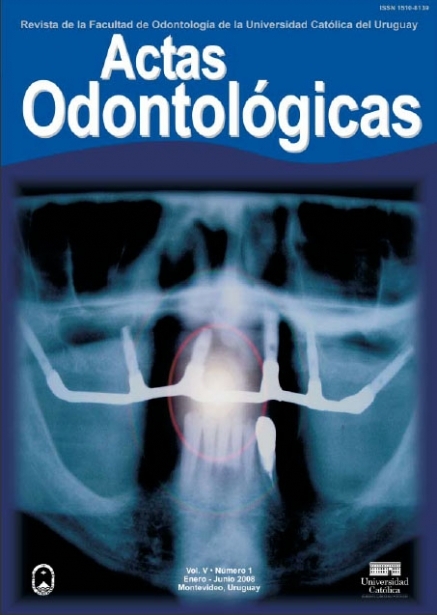 Disponible en: <http://revistas.ucu.edu.uy/index.php/actasodontologicas/article/view/1105>. Fecha de acceso: 20 apr. 2019 doi: https://doi.org/10.22235/ao.v5i1.1105.